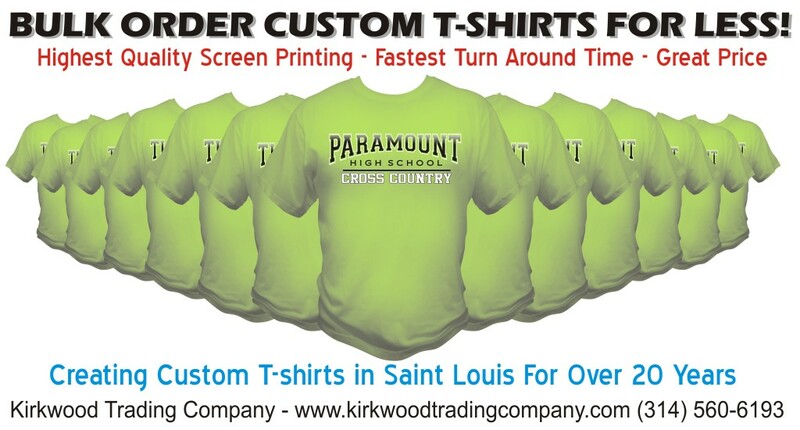 Kirkwood Trading Company provides custom screen print t-shirts for less. Bulk order custom t-shirts for less by Kirkwood Trading Company. A local Saint Louis based screen printer with over 20 years of experience selling quality custom tees to schools, churches, businesses, sports teams, foundations, organizations, and more. Everybody wants the best price possible when it comes to having something custom made. Custom tees are no different and Kirkwood Trading Company provides bulk order custom t-shirts for less. All of our graphics, printing, and design work is done in-house which saves our customers times and money. We pride ourselves on being one of the oldest custom t-shirt shops in the St. Louis area. We have grown our clientele through great service, excellent screen printing, and meeting and exceeding the demands of our customers. We have built relationships with our customers and a lot of our customers have become good friends. I developed a saying because we constantly hear such positive feedback from our customers in regards to the quality of our work and the competitive pricing we offer. I tell my clients that I don’t want to retire on one order, I want to retire over the course of time from repeat orders. We give you the best price available which usually is low enough to get the business but not so low you question our quality and methods. Ordering bulk order custom t-shirts for less is because our customers can save on our volume. We use the highest quality inks pared with some of the most experienced printers in the industry. Time in money and the faster we can get orders out the door the more revenue we generate. For the customer that means we meet or exceed their deadlines while giving them the highest quality product available for the best price. We even go a step further with saving our clients money and depending on their history with us or the job at hand, a lot of times we put artwork time in on their design at no charge. Another way we save our clients time and money is often times we can deliver your order to you free of charge as well. Whether you need 12 t-shirts or 12,000 t-shirts, with Kirkwood Trading Company bulk order custom t-shirts for less is not an advertisement, it’s what we do everyday.